Probiotics - Aniruddha Enterprises Pvt. Ltd.
Disease control in recent years has undergone a complete change with focus on infection prevention through better nutrition management. Specific species of probiotic bacteria are well documented to establish a beneficial gut microflora when added in poultry feed. LactoJet* is a scientifically blended probiotic formulation containing Gram positive Bacillus species bacteria. These bacteria are non- pathogenic & spore forming. The sporulated probiotic strains in LactoJet* start reproducing immediately once inside the gut releasing acids and thereby decreasing the pH of the gut. The low pH environment is hostile to many pathogenic bacteria. Acidification of gut prevents the growth of pathogens like clostridia, Streptococci, E.coli & Salmonella, thereby preventing occurrence of major diseases. Probiotic bacteria also adhere to the bird gut wall and drive away pathogens by competitive exclusion. In totality, LactoJet*makes certain that the G.I. tract flora is well balanced and the feed is properly digested & absorbed. 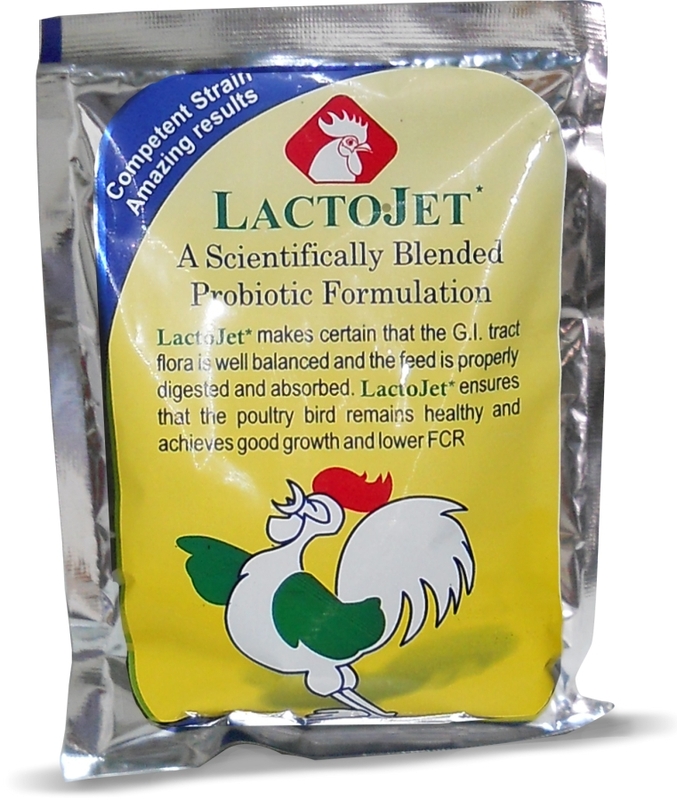 LactoJet*ensures that the poultry bird remains healthy and achieves good growth with lower F.C.R.